Do you know how amazing and powerful the LORD is, and how capable He is in transforming lives? 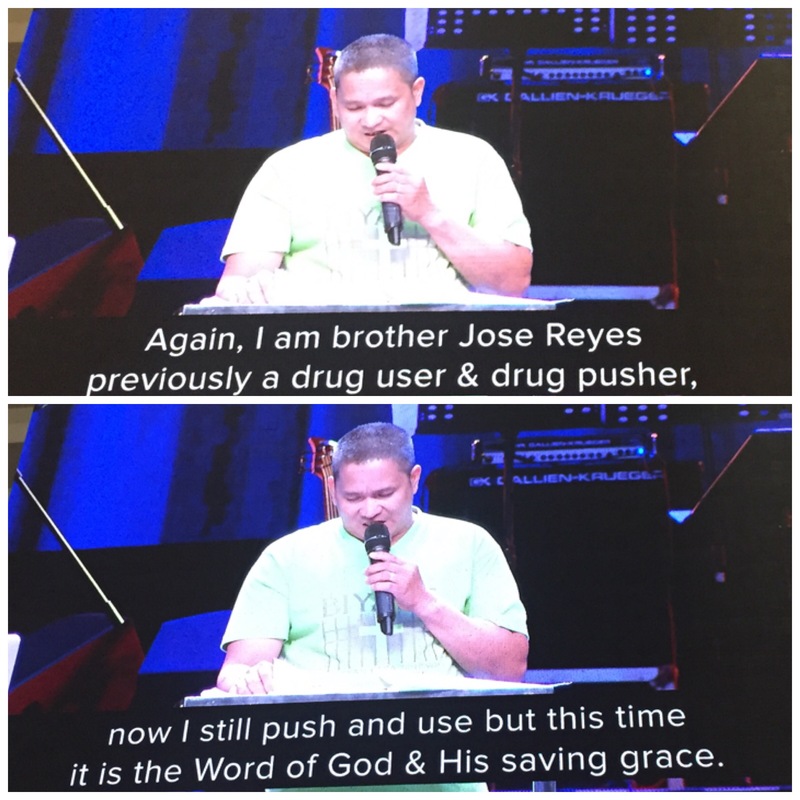 Today this man, brother Jose Reyes, bravely went onstage during Sunday service to testify on how coming to know Jesus brought him out of a life of drug pushing, womanizing, and various vices, and into the LORD’s family of believers. Now he is being used by God to minister to inmates, sharing his own story of being in and out of prison and how in Jesus Christ there is hope even in the seemingly hopeless of situations. Even in just a single day like today, God used him to speak to the tens of thousands in attendance during all four of CCF Main’s Sunday services, inspiring us all. Jose Reyes’ story is a modern day miracle. Just like how God transformed and used the killer Moses, the adulterer David, the self-righteous Paul, God is still in the business of making miracles. He’s still in the business of using sinful, ordinary people to show His extraordinary power–I know because I’ve witnessed it over and over again. And I know because just like them, my life was in such a deep, painful mess before I came to realize Jesus Christ died on the cross not to establish a religion, but to pay for our sins so we can have a personal relationship with our Father in heaven, so we can be in full communion with Him, experience unfaltering joy, and live the life He has predestined for us to live. This is God’s saving grace. This is the reason for living. This is the reason for hope. So if you’re struggling to find life’s meaning, maybe it’s time to search not within, but above. There is restoration upon repentance and surrender to the LORD. This is what true freedom is. This is true peace. It is not temporal, nor fleeting, nor shallow. It will sustain during the highest and lowest of days, and it will overflow into the lives of many. Brother Jose’s testimony today is solid proof of that. 2000 years after the one sinless man died for all sinners’ behalf, His promise to redeem still holds true. It is true for Jose, it is true for me, and it can be true for you. Do you have it in your heart to truly, wholeheartedly come to Him? The LORD is real. He is ready to show you when you do. Loved his testimony… I was actually crying while hearing this message on livestream​ this morning. I’m so blessed! I see you were there pala! 🙂 God bless you sis.